I’ve been incredibly lucky to be able to work these past few months illustrating ten different sensitive species native to New Mexico for an informational poster promoting conservation. I’ve learned a lot along the way, and each painting has definitely been a challenge (probably the least of which, the Gila trout… but we could all see that coming). I have some minor adjustments and one more bird to finish painting, then it is on to designing the actual poster! I will update the blog when the poster is finished, and hopefully have information on where the paintings themselves can be viewed. 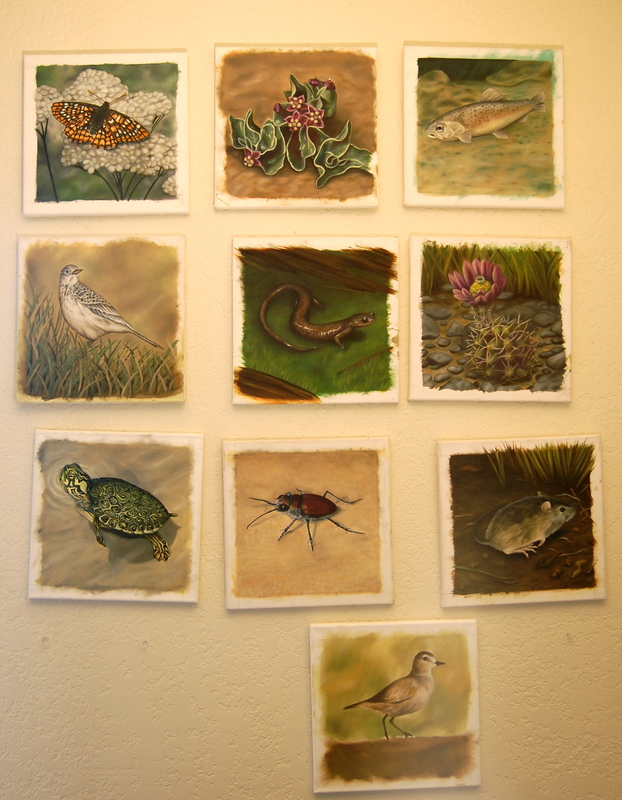 top to bottom, left to right: Sacramento Mountains Checkerspot butterfly, San Juan milkweed, Gila trout, Sprague’s Pipit, Jemez Mountain salamander, Kuenzler Hedgehog cactus, Western River cooter, Mescalero Sands Dune/ Tiger beetle, NM Meadow Jumping mouse, and a half finished Mountain Plover. I just showed these to my mom, and she asked me, “These are Katie’s paintings?” and I said yes. She asked me again because she couldn’t believe how good you are. Very talented!! Beautiful work. ha. you speechless? thank you thank you! Your collection is simply stunning! My favorite is the Western River cooter. They are all so life like I feel as though I could reach in and touch them. Thank you for sharing your beautiful work. Bud and Dee are right…you are a very talented young lady! thank you so much for the kind words Melanie! unbelievable! those are so real!!! !